A slide rheostat(sliding rheostat) is a circuit element that can change its resistance to act as a control circuit. During a circuit analysis, a slide rheostat can either be a constant value resistor or a variable resistor. The slide rheostat usually consists of five parts, terminal post, slide piece, resistance wire, metal rod and porcelain barrel. The resistance wire of the sliding rheostat is coiled on the insulated porcelain cylinder, and the resistance wire is coated to be insulation. 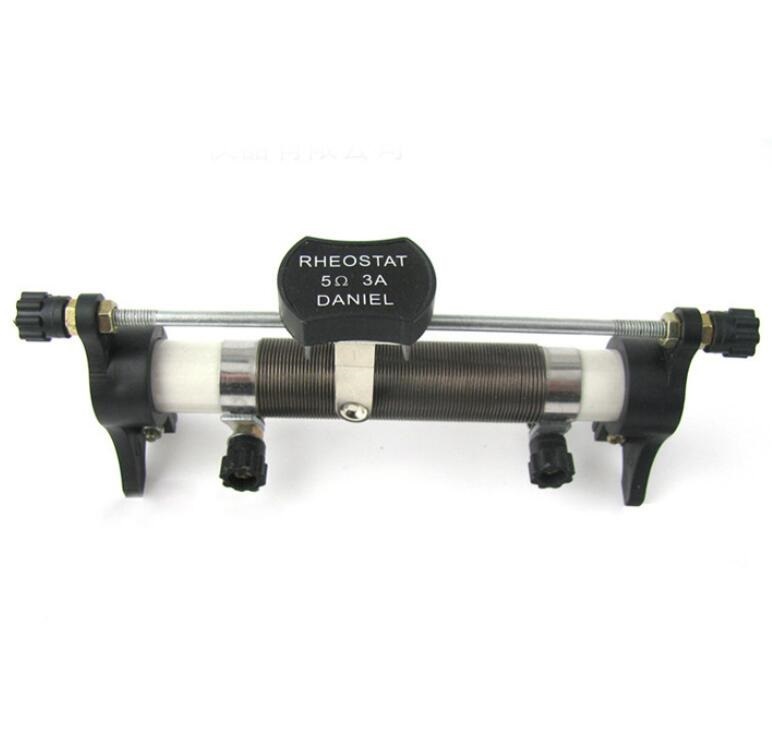 Slide rheostat is a common instrument for educational equipment and teaching equipment. The resistance wire’s material is mainly copper wire or nichrome wire, the resistance wire is coiled on the insulating cylinder, each end with is connected to a connecting port, the slide piece contacts the resistance wire and can be slided on the coil, so as to change then length of the resistance wire in the circuit. Its working principle is to change the resistance of the circuit by changing the length of the resistance wire in the circuit so as to gradually change the magnitude of the current in the circuit. The resistance wire is generally high melting point, high resistance Ni Cr alloy, while the metal rod’s resistance is generally small. The longer resistance wire in the circuit, the greater the resistance is, shorter resistance wire in the circuit, meaning less resistance in the circuit. (2) Change the magnitude and direction of the current in the circuit by changing the resistance of the access circuit, thereby changing the voltage at the ends of the conductor connected with the circuit. (3) Changing voltage. According to Ohm's law I=U/R, it can change the voltage at the two ends of the appliance in series. (1) Before using the slide rheostat to clarify its maximum resistance value and the maximum allowable current by value. Shall not exceed the maximum allowable current value through use. (2) Before using slide rheostat, slide back and forth several times, remove the dust and dirt on contact point to ensure good contacting. Before accessing to the circuit, maximize the resistance in the slide rheostat, so as to protect the power supply and electric meter. (3) Connect the slide rheostat properly. Otherwise the resistance is fixed on the max. value, or mini. value. (4) Avoid damage to resistance wire’s insulation coat, so as to avoid short circuit of interturn which will lower down the max resistance of the slide rheostat.